You can trust our distribution network to “over” deliver! 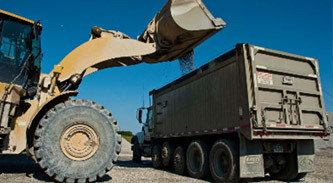 Being in the aggregates distribution business for decades has given us a unique advantage and logistical expertise. This expertise has translated into a full array of assets and relationships that allow us to quickly and economically supply any size project, even if it is outside our current footprint. Our strategically located, company-owned rail and river distribution locations, along with our truck dispatching capabilities, make our products accessible to any project site. We currently have the capability to deliver stone within an 8-state region (IL, IN, KY, MI, NY, OH, PA, and WV), so give us a call. Our highly-skilled dispatcher team will deliver. Our dispatchers have key relationships that place thousands of trucks at their disposal. By applying a customized dispatching software, remote ticketing systems and automated license plate readers, our team is able to ensure you have the exact tonnage when and where you need it. National’s extensive rail network will keep your project on track. We have multiple quarries that originate with four different primary rail carriers (CSX, Wheeling & Lake Erie, Norfolk Southern and Genesee & Wyoming), terminating with countless others. 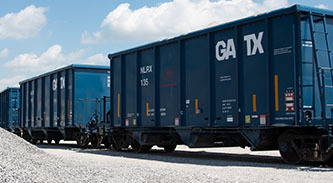 In addition to these connections, we have a significant number of large payload capacity rail cars at our disposal that include pneumatic cars, manual cars, and gondolas. This makes it possible for us to ship stone to our own distribution yards in areas without high quality limestone or directly to our customer’s sites and projects. 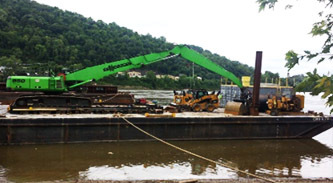 Our river distribution capabilities will land aggregates where you need them. High-quality stone products are shipped to these locations by water. Our sales docks are proud to provide superior customer service, cost-effective products and convenient availability in areas where no quality aggregates deposits exist. Each sales dock is equipped and designed for efficient off-loading of large quantities of various sized aggregates. 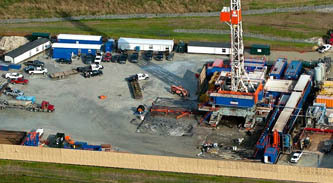 We can supply all of your needs in the Utica and western Marcellus Shale. With multiple asphalt plants, paving crews, and an ever-expanding aggregates distribution network, National and NLS are the premier suppliers of high-quality products to the Utica Shale market. With strategically placed assets throughout the entire region, we are your one-stop shop for aggregates, asphalt, and roadbuilding.